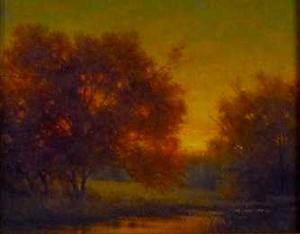 Autumn's raging beauty, piercing chill and fading light stir feelings in us all. 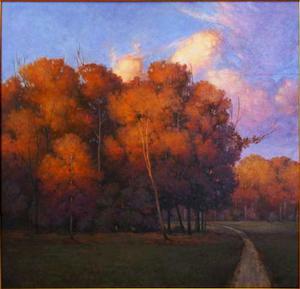 Landscapist Mason Archie is particularly responsive to the autumn weather and the viewer’s imagination easily travels into his scenes of this season. Come walk down a country road with the woman in Archie's Autumn # 4 painting. The day is starting to clear from a morning rain. Puddles in the road reflect skeleton outlines of the first trees to go naked. Yes, it’s a bit melancholy, this lone walk by a field of cornflower yellow. It’s an existential melancholy that reminds her of her own mortality and the inevitable end of all she loves…. A melancholy mellowed by knowing that a bright kitchen, whistling teapot and hugs await at her destination. 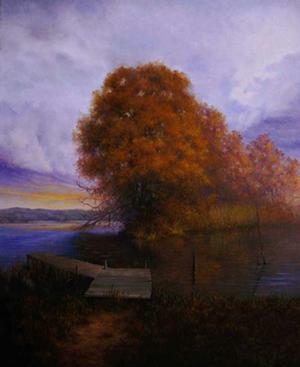 Mason Archie's work is reminiscent of that of 19th century master painters Robert Duncanson, Edward Bannister and the Hudson River School but his technique also blends impressionism with traditional landscape painting and sometimes includes human figures. Mason Archie autumn country is Indiana. The Indianapolis-based artist does not have a formal art education which makes his mastery of landscape art all the more impressive. When he was 16, Archie began working for Lamar Outdoor Advertising and learned to paint huge billboards for national corporations. By the time he was 21, he was the firm’s art director. After working for Lamar for 15 years, he opened his own advertising company. He eventually sold that business so he could devote full attention to his art. His self-study included reading Frank Mayer’s The Artist Handbook and a host of old master painting technique books and of course lots of practice. 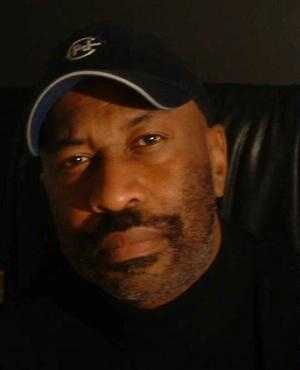 Since 2005 Archie has been studying and working with master portrait artist, Simmie Knox. They work on materials, technique and color. 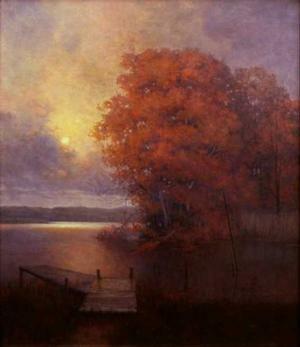 The colors of Archie’s palette tend to be autumn-toned even when the subject of the painting is not. One autumn afternoon after a heavy storm, the woman sets out in a different direction. The day is overcast. Wet russet. This time she's not headed to the friends' kitchen and her mood is shaded all somber by the day. But it’s okay. Somber is a quiet, soul-deep place — a good place for other emotion to come to rest. As she approaches the lake, a shard of sun breaks through, making way for the full orb to float upon the water. She walks out onto the landing, sits on the edge, a witness to nature’s unfailing metaphor of assurance: light out of darkness. It’s early November when she returns to the old wooden landing on the lake. Grasses drab, russets browning, late afternoon sky streaked with blue and gold — decay streaked with gladness. Again she sits on the edge of the landing. Dead branches in the water, a familiar lakescape trope? Or a metaphor of what? Death. Winter coming. And the rightness of it all. A successful struggle. 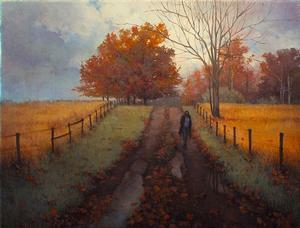 We look at these autumn paintings and feel. Whether it’s what the artist feels or what we feel independently of the artist is beside the point. Our feelings become enjoined through the making and the viewing. The ending phrase in this article of course is from “September Song” by Kurt Weill with lyrics by Maxwell Anderson.